— Mortimer J. Adler. He wrote a book called How to Read a Book that helped me become an effective reader. I was reading a blog by a cable manufacturer (Belden) this morning on the advantages of using Cat 6 cable over Cat 5e for network installations going forward (Figure 1 shows a great example of network cabling). Normally, I see the cable manufacturers recommending Cat 6 to customers because it will allow them to upgrade to 10 Gbps Ethernet, at least for runs less than 55 meters long. As much as 20% of the power through the cable can get “lost” in a 24-gauge Category 5e cable [relative to a Category 6 cable], leading to inefficiency. As we mentioned above, losing nearly one-fifth of the total power in a 24-gauge Category 5e cable may seem like a lot of power loss – and it is. But doing the math will show you that the total dollar amount comes out to be only around $7 per year. I will check these claims in this blog post. Table 1 summarizes some of the key characteristics of Cat5e and Cat6 cable. For this blog post, the important difference from a PoE standpoint is the wire gauge. Table 1: Key Characteristics of Cat5e and Cat6 Cable. Claim 1: 20% Power Loss on a PoE Line. 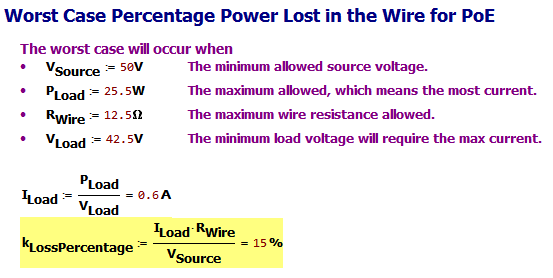 I was not able to confirm the 20% loss of the total power loss being attributable to the wire resistance. It is easy to confirm that as much as 15% of the total power loss is attributable to wire resistance. Figure 2 shows my calculations. So I would say that there claim is close to true. Figure 2: I calculate 15% for the maximum loss percentage. Claim 2: $7 Per Year Per PoE Line Cost. I was able to confirm their claim that each PoE line burns $7 per year in the wire resistance (Figure 3). That was a bit surprising. Figure 3: Annual Electrical Cost for a Running a PoE Line in the US. I read marketing claims all the time. Most of the time, there is some level of reality to them. In this case, one claim is close and the other is accurate. 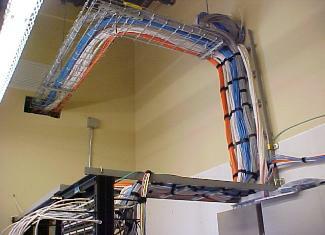 I was surprised at the cost yearly cost incurred because of the cable resistance.